Once, long ago there was a great kingdom named Prambanan . Tenteran and its people live peacefully . But , what happens then ? Prambanan kingdom was attacked and occupied by foreign Pengging . Prambanan kingdom tranquility be disturbed . The soldiers are not able to deal with attacks Pengging troops . 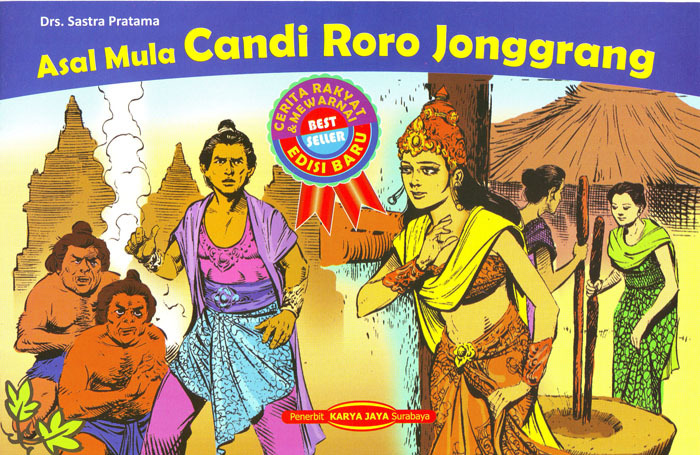 Finally , Prambanan kingdom ruled by Pengging , and led by Bondowoso . Bondowoso a bossy cruelly . " Anyone who does not do what I say , will be severely punished " , said Bondowoso on people. Bondowoso is a powerful force and have the genie . Not long in power , Bondowoso love watching the movements of Loro Jonggrang , daughter of the King of his beautiful Prambanan . " Beautiful nian 's daughter . Permaisuriku I want him to be , " thought Bondowoso . The next day , close to Loro Jonggrang Bondowoso . "You're so beautiful , will you be Permaisuriku ? " , Tanya Bondowoso to Loro Jonggrang . Loro Jonggrang flinched , hearing Bondowoso question . " This man once presumptuous , not to know me immediately wanted me to be his queen ," said Loro Jongrang in the liver . " What should I do ? " . Loro Jonggrang into confusion . Her mind was spinning . If he refuses , then it will Bondowoso furious and endanger his family and the people of Prambanan . To say yes would be impossible , because the Loro Jonggrang did not like Bondowoso .
" How , Loro Jonggrang ? " Bondowoso insisted . Loro Jonggrang finally get the idea . " I'm willing to be your wife , but there are conditions , " he said . " What are the conditions ? Want treasures galore ? Or a magnificent palace ? " . " No, my lord , said Loro Jonggrang . I asked for the temple , the amount should be a thousand pieces . " Thousand pieces ? "Cried Bondowoso . " Yes , and the temple was to be completed in a single night . " Loro Jonggrang Bondowoso stare , his lips trembled hold anger . Bondowoso Since that time thinking about how to make 1000 temples . Finally he asked his advisors . " I believe my master bias makes the temple with the help of Jin ! " , said counsel . "Yes , that's right you suggest , prepare the equipment I needed ! "Once the equipment at the ready . Bondowoso standing in front of the altar stone . Stretched his arms out wide . " Troops jin , Please help me ! " he shouted in a booming voice . Shortly thereafter , the sky became dark . The wind howled . A moment later , the troops had gathered Bondowoso jin . " What should we do sir ? " , Said the leader of the jinn . " Help me build a thousand temples , " pleaded Bondowoso . The genie immediately move to and fro , carrying out their respective duties . In a short time the temple was composed almost reached a thousand pieces . Meanwhile , Loro Jonggrang quietly observe from a distance . He was anxious , knowing Bondowoso genie aided by troops . " Well , what about this ? " Said Loro Jonggrang in the liver . He was looking for a reason . The royal ladies got together and sent them assigned to collect straw . " Quickly burn all the hay ! " Loro Jonggrang command . Most other ladies sent them to pound the mortar . Dung ... dung ... dung ! Radiating red tinge to the sky with the sound of the hustle and bustle , so much like the breaking dawn . Jin forces thought dawn was breaking. " Well , the sun will rise ! " exclaimed the genie . " We should get going before the sun burned our bodies , " said another genie . The genie is scattered left the place . Bondowoso was surprised to see the panic jin forces . The next , Loro Jonggrang Bondowoso invite to the temple . " The temple which you requested has been standing ! " . Loro Jonggrang immediately calculate the number of the temple . It turned out there were only 999 pieces ! . " The amount is less than one ! " Loro Jonggrang exciting . "That host has failed to meet the requirements that I asked " . Bondowoso surprised to learn that deficiency . He became very angry . " No way ... " , said Bondowoso glowering at Loro Jonggrang . "Then you are complete ! " he said while pointing his finger at Loro Jonggrang . Magic ! Loro Jonggrang instantly turned into a stone statue . Until now these temples are still there , and is located in Prambanan area , Central Java and called Loro Jonggrang .